Definition: An independent structure made from discontinuous compressional members connected by tensional members. This mechanical concept was introduced by Kenneth Snellson and promoted by R. Buckminster Fuller in the mid 20th century. 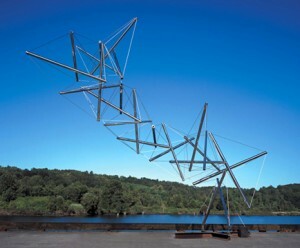 Tensegrity structures are an excellent model for illuminating systems that have dynamic polarity. 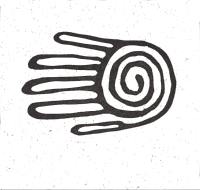 This polarity can be anything, such as electromagnetic, pressure, gravity, or even social structures. 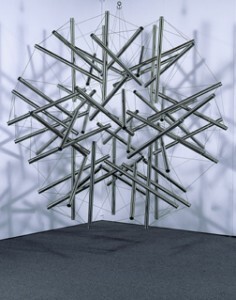 In this Tensegrity model, the polarity is provided by compressional and tensional elements. Here is a video I made demonstrating the strength and elasticity of a Tensegrity structure by partially disassembling it. It is interesting to see how the structure degrades non-linearly. It is worth mentioning that the tension component of this structure is not elastic – it is high test mono-filament fishing line. In the video it looks like it could be rubber. The Tensegrity models in the beginning of the video are Kenneth Snelson’s. 1: 1.1% of tensile connections. 2: 2.2% of tensile connections. 3: 3.3% of tensile connections. 4: 4.4% of tensile connections. 5: 5.5% of tensile connections. A 5.5% reduction in tensile integrity removes almost all of the structural integrity. However it is apparent from the video that perhaps 2/3 of the reduction in structural integrity occurred in the first two tensile eliminations. 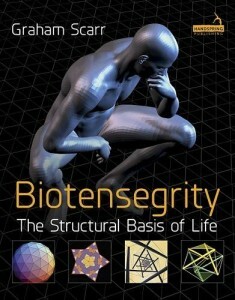 This book offers an excellent overview of Tensegrity as it applies to biological systems. It is very easy to digest, and has clarified some questions on the history of this subject, as well as gifted me with new insights as to how to apply the model to Manual Therapy. This book is a groundbreaking study of living tissue using endomicroscopy, including videos of tissue function at many differing resolutions. 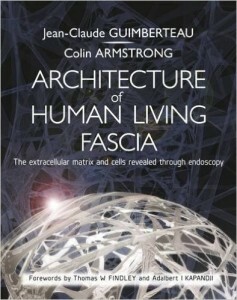 Two things are immediately apparent in reading this book: 1) connective tissue is fractal in nature, applying the same structural principles at many scales, and 2) the primary structural principle living tissue utilizes is tensegrity. Model of a joint articulation based on Tensegrity principles using a modified icosahedron. This model is an excellent demonstration of how a joint articulation can support structure without compressional members transferring load. 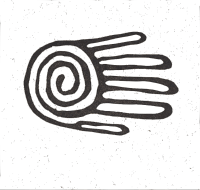 From “Biotensegrity – The Structural Basis of Life” by Graham Scarr. Next postThe Lymph System and Hanging by the Arms.